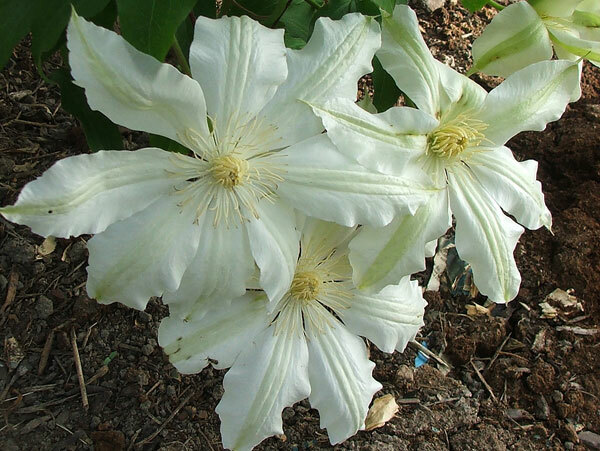 I've finally got a large-flowered Clematis growing. I must have gained semi-elite gardener status, acquiring a proper Clematis - after all these years of making do with the rampant, common Clematis Montana... A chance trip to a nursery that was closing down and voila! The clematis in question cannot be named, but it has grown jolly decently, climbing up one of the orchard rose arches - without me ever checking or pruning it. In fact I forgot all about it. Hmm... I was lucky to notice its first flowering in the spring of 2009. Will it bloom again? Hopefully! I remember paying about five dollars for it. And then I bought a second hand book called 'A Guide to Clematis' which is serious and unfortunately rather scary. It tells me that care during the first two years 'guarantees the growth of a fine plant'. Aargh!